With strong warm(ish) southerly winds and high cloud, I took a circular walk from Bo Peep to Blackstone Bottom hoping for Quail and raptors. I failed on both counts, but did find more singing Corn Buntings than ever before in my life – at least seven, probably ten, in the course of about a mile and a half. On the North face of the Downs the ‘fat birds of the barley’ are few and far between. I’m used to scraping by with the odd one or two. But it seems that as soon as you go beyond the sheep pasture into the arable towards Seaford, it’s bunting o’clock. 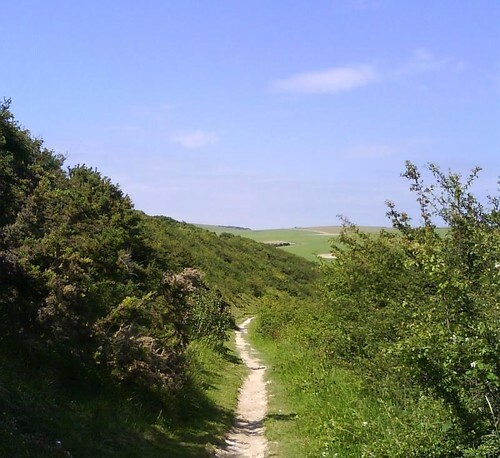 Along the long straight footpath (the one that links Blackstone Bottom just north of Seaford Golf Course with the South Downs Way a few hundred yards east of Bo Peep car park) there were at least five (probably seven). Most were singing pretty close to each other, and the two males nearest Bo Peep were engaged in feathery biffs. So good to see so many of them – the farmers must be doing something right here. Supporting cast provided by about twice that number of singing Skylarks, Willow Warbler in Blackstone Bottom, at least four groups of Linnets and Swifts all over the place.